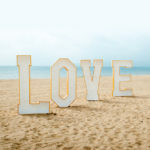 “We wanted a venue with spectacular views, so the Sandbanks Hotel was the perfect choice – we both fell in love with it! Also, having the option for our guests to stay the night was important to us. That way, they could enjoy the whole event without worrying about getting home. From the very first meeting, we knew our wedding planners were going to create a unique day for us. Plus, everything was incredibly organised from the off. They made lovely little touches with minimum instructions and were so thoughtful throughout the day, adding some gorgeous surprises. They were perfect in every way! The colour scheme for our wedding was ivory and silver, and my Sophia Tolli shoes and dress set the tone off nicely! With my two sisters as bridesmaids, they made sure every hair was in place. Whilst we got ready in the Sandbanks’ Wedding Changing Room, Liam got suited and booted at home. All our guests have commented on how much they enjoyed the food, from the canapés after the ceremony to the evening buffet. We had difficulties making our choices (as they were all very yummy!) but finally decided on the mozzarella tart starter, beef main and passion fruit dessert. It was all absolutely delicious and beautifully presented.